If Space Camp is accessed from R&D, the Runner must reveal it. 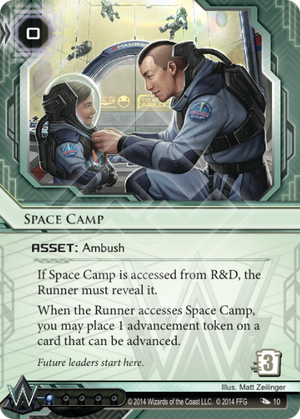 When the Runner accesses Space Camp, you may place 1 advancement token on a card that can be advanced. This card is so good. Not only does it fire from anywhere - be it R&D, HQ, Archives or a remote - Space Camp also allows you to do wonders with advancable traps and ice. Got a runner who likes heading into Archives for Datasuckers? Guess what, a single copy of Space Camp there will help you boost up your Ice Wall, Fire Wall, cosmic ice, trap or agenda every time he does that. Couple it with a Cyberdex Virus Suite in the archives, and you'll be ruining the runner's day in no time. Being an asset, Space Camp is also great to plonk behind a glacier during a fake scoring window to test if the runner will run. If he shows that he's not going to run, that's fine: just replace it with an agenda later on. If he does run, well, guess who has two thumbs and just got a click and a credit for free?